The buffalo nickel, one of the most interesting coins ever produced by the U.S. Mint, features a portrait of a Native American with a buffalo on the obverse with the word ‘liberty’ prominently featured on the rim. These Buffalo nickels were struck from 1913 to 1938, with a break during 1932 and 1933 during the great depression. 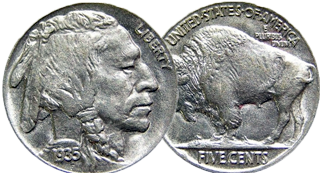 The Buffalo Nickel – or Indian Head Nickel as it is sometimes called) was minted at the Denver, San Francisco, and Philadelphia mints. With over 1 billion coins produced, some original buffalo nickels remain in circulation today. The letter “F” on the coin refers to the coin’s designer, James Earle Fraser, a renowned naturalist. The Jefferson nickel replaced the Buffalo nickel.